Leslie Howard with his on-screen sister Alicia Rhett. She was a true Southern lady. Alicia Rhett was discovered on George Cukor’s Southern search for Scarlett O’Hara for the epic film “Gone with the Wind” (1939). Rhett was cast as Ashley Wilkes’ sister, India Wilkes, in one of the biggest films of all time. But Rhett’s art was more important to her than stardom. Rhett was born in 1915 in Savannah, GA. After her father was killed in World War I, her family moved to Charleston, SC, according to McQueene’s book. Casting the role of Scarlett O’Hara for the 1939 movie wasn’t an easy. Hundreds of actresses were considered. Director George Cukor made a trip through Southern states, believing an unknown actress may be the answer to their problem. 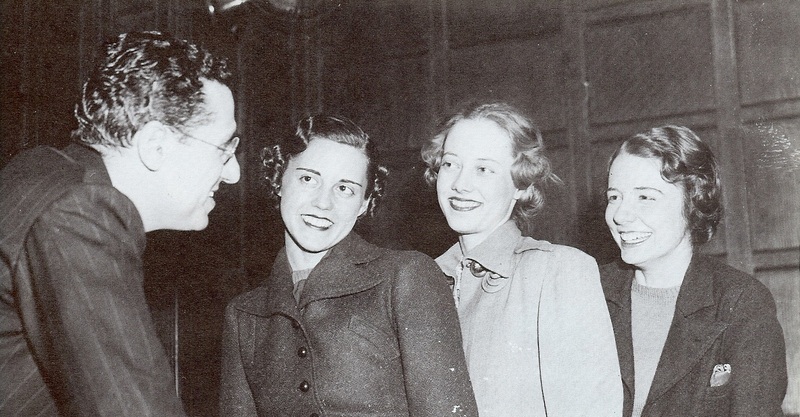 Director George Cukor with interviews actresses to play the role of “Scarlet O’Hara”: Louisa Robert, Atlanta; Susan Fallingant, Atlanta; Alicia Rhett, Charleston. 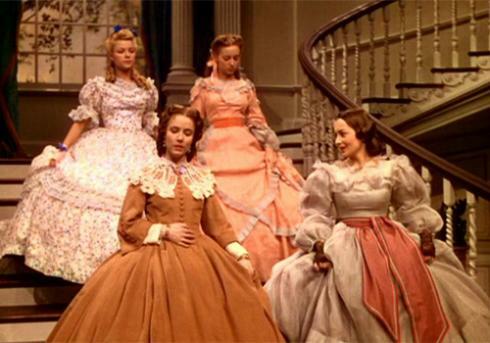 Hundreds of Southern women auditioned for the role of Scarlett, Melanie and Mammy, but only six women were considered for follow up auditions, according to “The Art of Gone with the Wind: The Making of a Legend,” by Judy Cameron and Paul J. Christman. 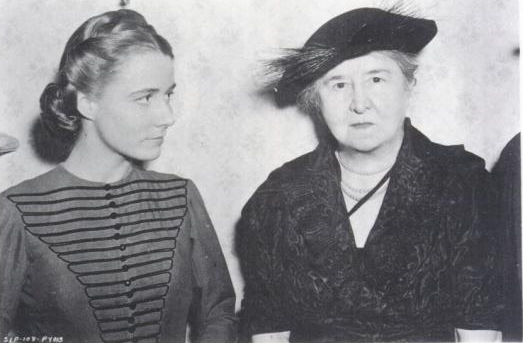 The auditions took place in 1937 in New York and the only Southerners who won roles were Alicia Rhett from Charleston, Mary Anderson who was cast as Maybelle Merriwether from Birmingham, AL and Marcella Martin of Shreveport, LA who was cast as Cathleen Calvert. Martin’s lines were dubbed because her accent wasn’t considered Southern enough, according to the Cameron and Christmas book. 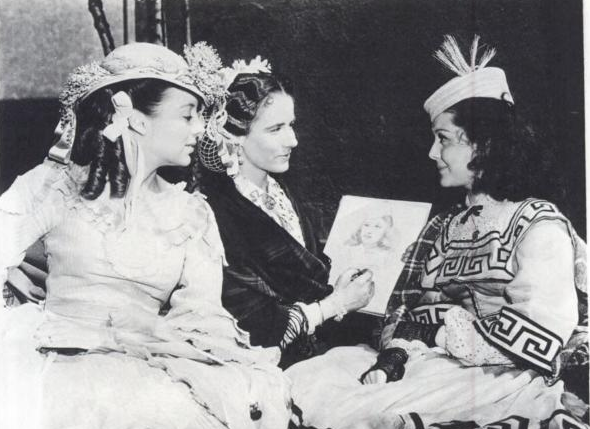 During the filming of “Gone with the Wind,” Alicia Rhett made sketches between takes. Here with Evelyn Keyes and Ann Rutherford. Rhett was acting when Cukor found her in Charleston. She was performing in the Oscar Wilde play “Lady Windermere’s Fan” at the Dock Street Theater. 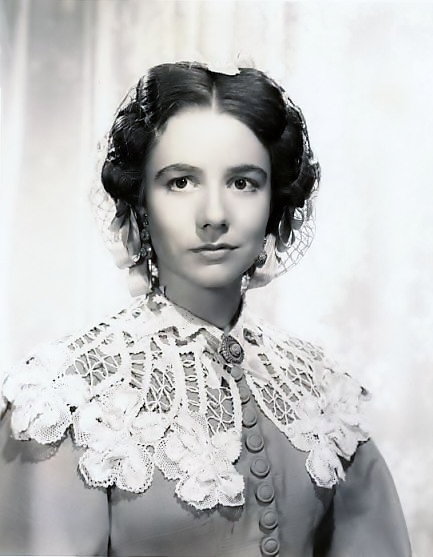 Her performance in the Wilde play had “style and élan,” said “Pictorial History of Gone with the Wind” by Gerald Gardner and Harriet Modell Gardner. Alicia Rhett visits with Mrs. John Woodbury from Louiseville, KY. Woodbury was the past-president-general of the United Daughters of the Confederacy. The Daughters dropped by to visit the filming of the Civil War film. “Gone with the Wind” novel author Margaret Mitchell liked Rhett for her name, according to the Gardner book. 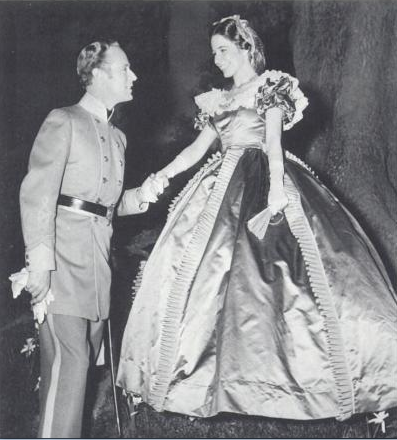 As Rhett performed in the epic Technicolor film about the Civil War and the Reconstruction of the South, Rhett had her own family Civil War history. Her great-grandfather was Robert Barnwell Rhett, a secessionist politician from South Carolina, according to “A Short History of Charleston” by Robert S. Rosen. Robert Rhett became a member of the South Carolina legislature in 1826 and resigned from the United States Senate in 1852 when South Carolina seceded from the Union. Though she was an unknown actress, Rhett enjoyed the company of her A-list co-stars. She said Leslie Howard, who played her on-screen brother Ashley Wilkes, was “delightful” and Clark Gable, who played Rhett Butler was “charming,” she said in an interview with McQueene. Rhett (bottom right) in a scene with Marjorie Reynolds, Evelyn Keyes and Olivia De Havilland. Rhett kept in touch with her on-screen sister-in-law Olivia De Havilland, who played Melanie Wilkes, for many years after filming. And she said Vivien Leigh was “just as pretty in person as she was on-screen,” McQueen quoted her. But she returned to South Carolina after filming to embrace her first love: art. Rhett went on to be one of the most important artists in Charleston, specializing in children’s portraits and also having her work hung in the president’s office at The Citadel. Still living from the cast includes Olivia De Havilland, Mickey Kuhn who played Beau Wilkes and Mary Anderson. This entry was posted in Classics in the Carolinas, Star Deaths and tagged Alicia Rhett, Gone with the Wind, India Wilkes by Jnpickens. Bookmark the permalink. I saw that Alicia had passed away, and I didn’t realize she was still with us. I had no idea about her life — her drawing in the picture you posted looks very good. It’s nice that she had a good time filming, but also knew her real love and stuck with it. Very interesting! She sounds like a remarkable woman. I admire that she forsook movies to pursue a greater passion. So many people in similar situations hung around Hollywood hoping for a big break and ended up in an unfortunate way. For what it’s worth, I can never really forgive the makers of “Gone with the Wind” for not giving Alicia Rhett a bigger role in this film. I absolutely loved her as Scarlett O’Hara’s arch-nemesis.